Cold and flu are both viral infections. You are equipped to fight a cold and flu if you wash your hands when required. Avoid high fat, indigestible foods such as cheese, red meat and pastries. Cold and flu are both viral infections. The two might differ in magnitude, but some of the common symptoms are the same; sore throat, fever, running nose, cough, fatigue and nausea. If you are looking for healthy ways to fight a cold or flu, then this article should provide what you need. You are equipped to fight a cold and flu if you wash your hands when required. Make sure you wash them for about 20 seconds; your kids will automatically ape this ritual and provide for a cold and flu-free season. Avoid milk and other dairy products, as it triggers the release of histamine, a chemical that contributes to a runny nose and nasal congestion, and can hinder your recovery. Grapefruits will help to provide immunity against cold and flu symptoms; it is high in vitamin C and helps to detoxify the liver. Eat as many fruits as you can; this is certainly a healthy way to fight the cold and flu. Honey bees are renowned for their immunity. Honey is considered to be one of the most effective home remedies to fight cold and flu. Make sure you avoid giving it to children less than 12 months. Detoxify your body by a regular intake of fluids, such as tea or water with lemon. Keep in mind your urine rids you off all the toxins produced by a virus. Practicing yoga strengthens your thymus gland which is responsible for a strong immune system. “One must do Kapalbharti, Chakraasan, Surya Namaskar, Halaasan and Sarvangaasan”, says adds Dr. Deepak Jha, Lifestyle Yogalogist at Real Yoga. Needless to say that decongesting your chest from a cough provides relief. It is advised that you gargle. Prepare a solution of lukewarm saline water. When you gargle, your sore throat finds some relief. No matter how much you try to recover from a cold and flu, nothing helps better than rest.. It is a known fact that six to eight hours of sleep can work wonders. Your body can repair itself from the symptoms of a cold and flu. If you have a running nose, put an extra cushion under your head as it allows for nasal discharge. If possible take a steam bath or shower, the reason being that it moisturizes your nasal passage and provides instant relief; you may then blow your nose as and when required. 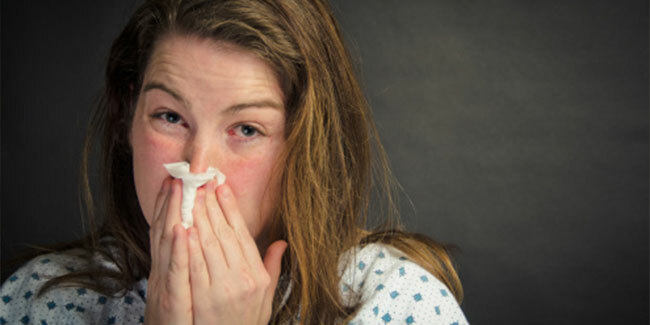 When you are sneezing cover your nose and mouth to prevent germs from spreading. Show that you care -- about yourself and those around you. In your fight against your cold and flu symptoms, keep all the above in mind!